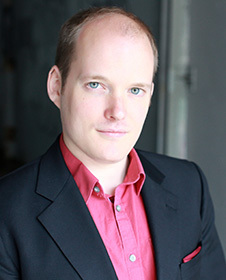 American-Canadian Zach Finkelstein has quickly established himself as a leading tenor soloist in North America and abroad, from Seattle’s Benaroya Hall to New York’s Lincoln Center to Toronto’s Koerner Hall to London’s Sadler’s Wells to II Bienal Internacional de Teatro in Guadelajara, Mexico to the National Arts Center in Beijing, China. In the concert world, Zach is known for his “refined” and “elegant” (Vancouver Observer) interpretation of the works of Bach, Mozart and Handel, among others. In the 2014-2015 seasons, Zach sang 13 performances of Handel's Messiah with the Virginia Symphony, Portland Baroque Orchestra, Victoria Symphony and the Rogue Valley Symphony; seven performances of Bach's Weihnachtsoratorium (his Evangelist "first among equals", Vancouver Sun) with Stephen Stubbs' Pacific Music Works, Early Music Vancouver, Victoria's Pacific Baroque Orchestra, Portland Baroque and the Symphony Nova Scotia; he performed with the Seattle Symphony as the tenor soloist in the Mozart Requiem under Ludovic Morlot and as tenor soloist in Carmina Burana with the Pacific Northwest Ballet; he sang Bach’s Johannespassion with the Portland Baroque Orchestra; Handel’s Dettingen Te Deum and Haydn’s Missa in tempore belli with Jane Glover and the Music of the Baroque in Chicago; Handel’s Israel and Egypt with Orchestra Seattle; Rossini’s Petite Messe Solennelle with the Bach Elgar Choir in Hamilton, Canada; Handel's Solomon and Mass in B Minor at the Elora Festival in Ontario; and Bach Cantatas 106 and 182 at the Whidbey Island Music Festival. In 2016-17 Zach’s performance schedule includes Haydn’s Creation in Toronto with the Toronto Mendelssohn Choir and Orchestra; Bach Mass in B Minor and Advent Cantatas with the Pacific Music Works; Bach Magnificats (JS and CPE) with the Elora Festival; 16 performances of the Christmas Oratorio and Messiah with the Calgary Philharmonic, Regina Symphony Orchestra, Florida Orchestra, Amadeus Choir, Kevin Mallon’s Thirteen Strings, and Masterworks of Oakville Orchestra and Chorus; Matthäus-Passion (Evangelist) with Thirteen Strings; Satie’s Socrates in Texas with the Mark Morris Dance Group; Beethoven’s 9th Symphony with the Portland Chamber Orchestra and Walla Walla Orchestra; and recitals in San Antonio, TX; Lake George, NY; Seattle, WA and New York City. In 2016, Zach also was a finalist in the Tafelmusik Vocal Competition and was selected as a Virginia Best Adams Fellow at the Carmel Bach Festival. Recently hailed by Anthony Tommasini of the New York Times as a “compelling tenor,” he made his New York City Opera debut in April 2013 as Mambre in Rossini’s Mosè in Egitto, a production dubbed by Tommasini as one of the Top 10 classical events of 2013. In 2014-15, Zach sang the role of Damon "with sensitivity and grace" (Boston Classical Review) in Acis and Galatea, performances conducted by Nicholas McGegan leading Philharmonia Baroque in Berkeley, CA as well as with the Handel and Haydn Society in Boston, MA. In 2016, Zach made his haute-contre debut as Orphee in back-to-back productions of Gluck's Orphee et Eurydice with Brava! Opera Theatre (English) and Opera Grand Rapids (French). Mr. Finkelstein is also an evangelist for new and contemporary classical works, an oeuvre he discovered as a two-time Vocal Fellow at the Tanglewood Music Festival. This May, Zach will be premiering the Pulitzer Prize-winning piece ‘Comala’ by Ricardo Zohn-Muldoon in Guadalajara, Mexico with the Zohn Collective and again in 2019 at the University of Notre Dame. Zach will also guest in May 2018 as an artist-in-residence at UC-Davis, premiering a new piece by composer Kurt Rohde. In 2015, Zach premiered a new work Threshold for tenor and orchestra with the Argento Ensemble, a piece created specifically for Zach by Prix-de-Rome-winning composer Jesse Jones. The New York Times’ James Oestrich commended this “excellent” performance: “Zach Finkelstein negotiated Mr. Jones’s high tenor flights with aplomb”. Satie’s Socrate, a thirty-minute political monodrama for tenor and piano (“beautifully sung”, UK Daily Telegraph), has also become a signature piece for Mr. Finkelstein, toured regularly with the Mark Morris Dance Group across the United States as well as London, UK and a recent debut in Shenzhen and Beijing, China. Zach also performed the American premiere of Harrison Birtwistle's Songs from the same earth with pianist Mike Brofman at the Brooklyn Art Song Society, returned in 2017 season to perform a recital of Jake Heggie and Reynaldo Hahn and will perform again with BASS in 2018 touring Seattle and California. In the media, Zach launched his first album in October 2017 on Scribe Records, ‘Britten and Pears: the Canticles’ featuring Byron Schenkman and principal players from the Seattle Symphony. Zach has performed opera excerpts on CBC's Saturday Afternoon at the Opera as well as Toronto's Classical 96.3 FM and Seattle’s KING FM. Both Musical Toronto and Opera Canada Magazine have profiled Mr. Finkelstein as a singer to watch. Mr. Finkelstein is currently with Dean Artists Management and holds an Artist Diploma (Voice) from the Royal Conservatory of Music’s Glenn Gould School in Toronto and a Bachelor of Arts (Honors) in Political Science from McGill University, in Montreal. As a young artist, Zach participated in the Tanglewood Music Festival, Banff Opera as Theatre, the International Vocal Arts Institute and the Britten-Pears Young Artist Programme.